War must throw so many things awry. I’ve always read of the atrocities committed to women, but I’ve never considered the ways that women must have combatted war themselves. Instead of focusing on the honor, and the hard work, and the buck up kind of attitude I’ve been taught that women felt during war, To Bed With Grand Music shows us an entirely different point of view. Deborah’s husband leaves for war, with an admonition that he may not be faithful physically, but it won’t change a thing between them emotionally. Soon afterward, she leaves her country cottage for the excitement of London, leaves her son in charge of the housekeeper, and leaves her devotion to her husband behind with each fresh dalliance she encounters. Swathed in furs and jewels bestowed by her admirers, enjoying dances and dinners rather than tins of beans, Deborah indeed goes to bed. With man, after man, after man. It seems she will never get out of it again, for how can lives be repaired when war has irrevocably divided them? This sounds like another one for my wish list, and I love your teacup! Great review. I can't wait to read this! The photo alone makes me want to read the book, and your thoughts on it make it even more inviting. Claire, your review is quite powerful. You really got into the heart of the emotions, and made me feel almost as angry at Deborah as I did while reading the novel myself. It's brief, but wonderful!, and I'm glad you like the teacup. I'm so lucky that my mother gave me roughly half her collection that I might enjoy them to; it's a family to tradition to drink British tea out of British bone china teacups, and somehow, a 'beaker' just doesn't seem to make the tea taste as good! I hope you can obtain a copy, Vasilly! Or, perhaps you have one already? I can't remember, but I know Persephone books are a tad difficult to obtain in the states, especially the more obscure ones. However, I did order The Chaise-Longue last night used on amazon.com for a mere 12.99. It's a first edition, too, so how lucky is that?! Becca, we would have so much to discuss when it comes to Deborah's character and the issues that are raised. For example, I don't think it acceptable under any circumstances, even war, to be such a sleep-around as she is. Beautiful picture, and I too love the teacup.This book seems to evoke a lot of thought and emotion from people, I'm not yet sure if I could deal with the Deborah character, but at the same time it sounds s fascinating that I think this is a must-read. Your picture is gorgeous! I was sucked into the review based on that picture alone. Then, I discovered that this book sounds amazing and have already added it to my Wish List. Thanks for sharing! Deborah is certainly not an admirable character, but she is an interesting one to ponder. She evokes a lot of emotion in me, much like the animosity I felt toward Briony in Ian McEwan's Atonement. This sounds like an interesting novel, reminding me a bit of Kate Chopin's The Awakening. Or Edith Wharton's The Age of Innocence. I swear I have that exact same tea cup! I love your review, and your photo- your tea and saucer looks like my American Beauty china. Very beautiful. I've enjoyed Persephone Reading Week! I love all the reviews I've read and want to scoop every book. AND make your pinches! Claire's and your review of this book made it sound very intriguing. I love the premise. 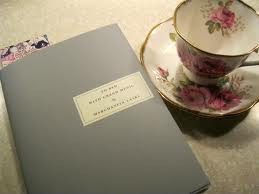 I have yet to try a Persephone book, but I'm just not sure where to start. I'm thinking of Miss Pettigrew Lives for a Day because that is available at my library. I've never read The Age of Innocence, but I've long wanted to. The significant difference between this novel and The Awakening is that Deborah is flat out value-less. Rather than establishing an illicit love affair, she sleeps with many men for no reason than entertainment. Or, presents. It's so sad; she's so depraved. I'll bet dollars to doughnuts we have the same cup! It couldn't be any other way. Miss Pettigrew Lives for a Day was my first Persephone, and personally, my least favorite. I'm in a huge minority here, but I still prefer the ones I can sink my teeth into and ponder for months afterward. Like The Home-Maker or this novel. I want to scoop up every book, too! Reading the reviews is not helping in lessening the passion, either, for treats in good books or good shortbread. I'm so curious about the title – I've gone about reading reviews and haven't found one yet with any mention of "the grand music". It seems there was very little grand about Deborah's life, and everything sounds out of tune. A good dose of irony from the author, perhaps? I feel as though I'm the only person in the blogging community who is yet to read Laski! Thanks for the review – just reminds me that I should do that sometime soon. This book does sound really interesting, and between claire's review and yours, it's making it to my to-read list! I couldn't find an explanation to Grand Music, either, Linda, except for in an ironical sense. To bed with an illusion of grand is what it seems to be, only when she wakes up, I think she'll find that she's very much alone. Wasn't this just a wonderful read even if Deborah was an awful person? I hate to think what happens when Graham comes home. I just feel for him! P.S. Loving the new look, ha ha. I also loved the one before this, with the light grey background. I kept thinking that Deborah would 'get better', that she would realize the ills of her ways and Stop It. But, she never did, and I can't bear to think of her son growing up basically without her, or Graham coming home. How can this work out for any of them? Sounds intriguing…why didn't the man just keep his mouth shut…there's such a thing as being too honest, I think. Probably, that set her off?